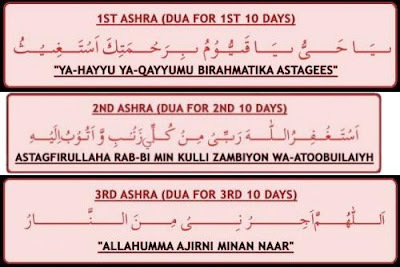 I received this information on Dua's for my post yesterday on 3 parts of Ramadan. The second ten days of Ramadan are the days of Forgiveness, Seek Allah's forgiveness and repent for all sins. (Our Lord! Forgive us our sins and remit from us our evil deeds, and make us die in the state of righteousness along with Al-Abrâr (those who are obedient to Allâh and follow strictly His Orders).